I know, I know. I can’t really hate Atticus Finch. First of all, he’s not real, he’s just a character in To Kill A Mockingbird. Second, he’s a noble character — a paragon, really. A lawyer who fights against racism in a small southern town in the 1930s. A widower trying to bring up a couple of kids on his own. He was played in the movies by Gregory Freakin’ Peck, for god’s sake. As played by Peck, Atticus Finch was voted the greatest hero of American film by the American Film Institute. 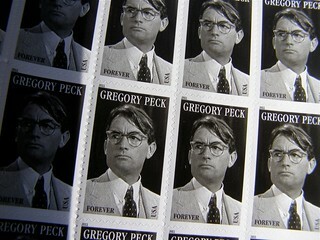 He has a goddam postage stamp! Daniel Baldwin and Isabella Hoffman named their son Atticus. So did Summer Phoenix and Casey Affleck. How could I hate Atticus Finch? Because I work in the world of legal marketing, and in that world, everything is named Atticus. There’s Atticus coaching, Atticus Digital Marketing, Atticus Rainmakers, Atticus Marketing in the U.K., Atticus Business Consulting, Atticus Management, Atticus Atticus Atticus. One of my friends in the business named his new firm Atticus and must have gotten a whole collection of cease-and-desist letters since he subsequently changed the name of his firm to Mockingbird Marketing (couldn’t get too far from Atticus). My question to lawyers is: don’t you guys and gals have any other heroes? What about Abraham Lincoln Marketing? Or Clarence Darrow Coaching Program? Or the She-Hulk? Thomas Moore? Matisse? Julio Iglesias? Robert Kennedy? Gloria Allred? Alger Hiss? Nelson Mandela? Fidel Castro? Gandhi? Anybody — but Atticus Finch.